When I wake in at three in the morning and can’t get back to sleep my mind usually turns to things photographic. The other night I asked myself the question, what makes a good photograph? Not only difficult to answer but it is always different things for different people. Of course, that is the way it should be because if we all liked the same things it would be a very dull life. Part of the answer depends on who and what the photo is intended for. A greeting card or chocolate box need only have a pretty scene. A Fine Art Image, for sale at a relatively high price, must have unique characteristics that make it desirable, a potential talking point while not being garish as well as being technically excellent. A picture destined for a slideshow or album to retain memories need only show the place and people you wish to remember. Aiming for a top score at your Club or Honours at PSSA requires thought, excellence and a thorough knowledge of photographic rules and how to use them as well as when to break them. I don’t think that you can photograph to a formula and be consistently successful but here are most of the elements one can select from to use in a composition. What you decide to use and how you do it must fit the subject and add to the photograph. When the selected aspects dovetail they contribute to a great photograph. Discussing these elements could take pages of explanation and examples for each aspect but rather than do this I challenge readers to pick one a week and use it in a number of photos, preferably with some outside of your comfort zone. In doing so you will learn the difference between them as well as how and when each element can be used. The next step is to try combinations of different elements to see how they can fit together. While this is not a great image it pulls the eye and tells a thought provoking story. 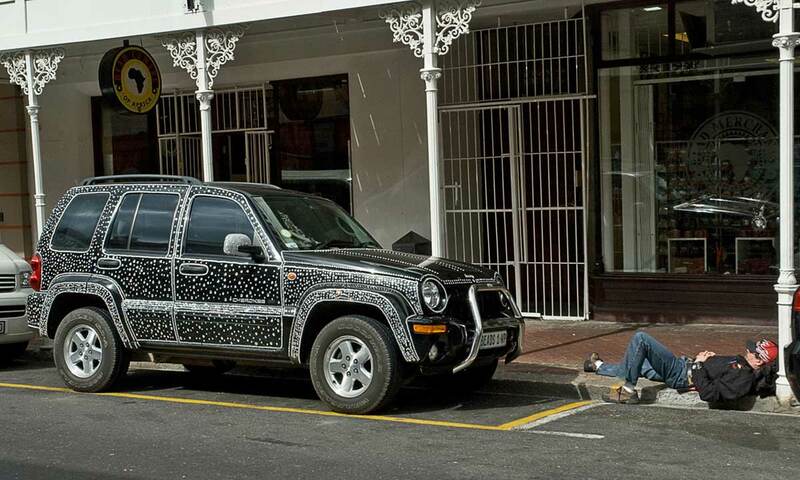 You see the glitzy Jeep and then the person on the pavement and you wonder what he is doing there. Is it drugs, alcohol, a homeless person or just somebody killing time?